Detailed photos of the items on this page can be found in the "Christmas 1" album in the Photo Gallery Index. Below are the different Nativity prints from which you can choose. Geode Slice Ornaments come in varying shapes, sizes and colors. You may choose approximate sizes but colors will be selected by the Sisters based on the icon print used and what is available. Each will come with a gold chord for hanging as well as a hand-written "Merry Christmas" message on the back. You can choose from the "natural" slice style that has rough edges and unique uneven shapes or the plain circular style. Besides Nativity icon prints, also consider icons of Christ, the Theotokos, Archangels and Patron Saints. 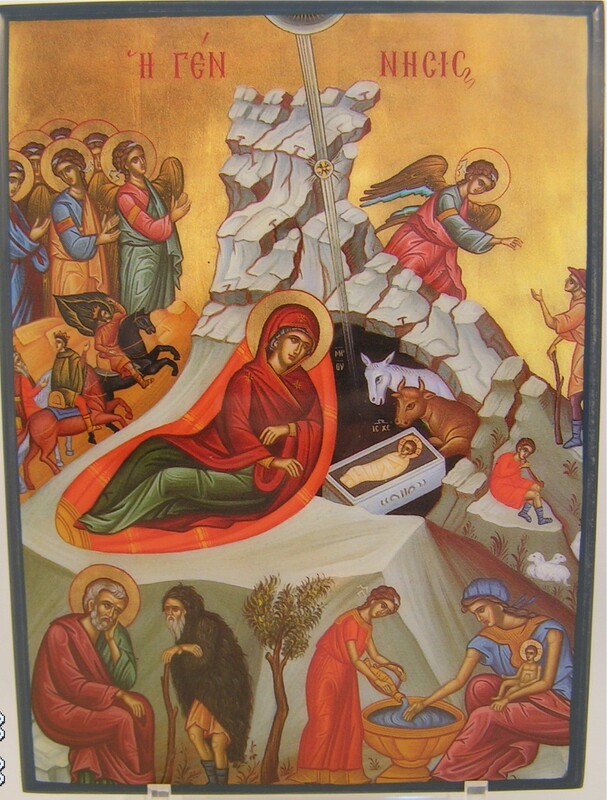 Be sure to specify what Nativity print (shown above) or other prints you would like when ordering. These ornaments are mounted on wood with a gold painted border and are approximately 3½" in diameter. They include a circular ring and gold chord for hanging. The acrylic box is nice for gift giving. It includes some festive decoration and the ornament is supported by gold chord tied through the top of the box. Background and primary colors will be selected based on the icon prints used and will be matching on the front and back.